About The Bahamas - Mosko Realty Ltd. 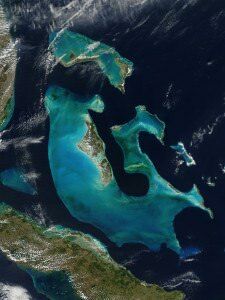 The Islands of the Bahamas lie in the southwest Atlantic Ocean east of Florida, USA stretching down to Cuba. Covering over 5,358 square miles starting just 50 miles off the Florida coast, the Bahamas is compromised of 700 coral based islands with more than 4,000 islands, islets, and cays. In comparison, the Bahamas is a little over twice the size of Prince Edward Island in Canada, slightly smaller than Northern Ireland and Connecticut. This small archipelago of islands is home to the world’s 3rd largest barrier reef found, crystal clear blue waters on the planet, pristine white powdery sandy beaches and unique rich culture. and other areas of the globe, great investment incentives for Foreign investors and developers and fully developed and organized infrastructure. The Bahamas declared independence from Great Britain on July 10, 1973 and its currency is the Bahamian Dollar (B$). The US Dollar (US$) is normally accepted throughout the Bahamas and it is on par with the Bahamian Dollar. 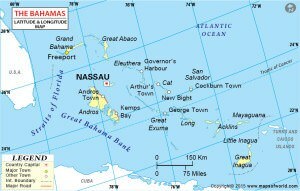 The Bahamas has a total population of 353,658* (2010) with the most populated islands being Nassau – 248,948, Grand Bahama – 51,756, Abaco – 16,992, Eleuthera – 7,826, Andros – 7,386, Exumas – 7,314 and Long Island – 3,024. Since January 1st, 2015, the Bahamas implemented a “Value Added Tax (Vat)”. As a result, a VAT charge of 12% will be charged on commissions, legal fees and appraisals. Experience the islands yourself where there is something for everyone from a hustling city in Nassau to a relaxing outer island, from luxurious waterfront beachfront estates to starting family homes with lots of in betweens. The islands of the Bahamas is a great place to invest in for a second home with its close proximity to the Americas it is easily accessible. Click here to view the different Islands of the Bahamas!